Fish are not only valuable for the purpose of angling, they also form an elementary part of aquatic biodiversity. In the ecosystem the fishes play an important role as “water managers”: The individuals influence, for example the nutrient distribution in rivers and lakes and transport both useful and harmful matter through water bodies. While feeding they control the food web. Some populations shape even the sediments while digging. Nearly all fish populations in inland waters worldwide are threatened by non-fishery related influences (the loss of habitat, for example). Around half of the native species found in Germany are either vulnerable, or threatened with extinction. Angling clubs play a key role in German freshwater fisheries management. 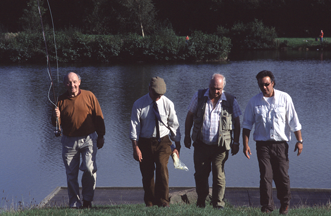 The angling club members, volunteers as well as employees, are very active in fostering fish populations, and often do so very effectively. In Germany, angling clubs play an often underestimated, though key role in freshwater fisheries management. They are the main owners or tenants of inland water bodies in this country. According to German law they are not only allowed to harvest from these waters, but they are also obliged to manage and care for these water bodies. The number of people taking part in this hobby, for reasons of recreation, fresh fish consumption, and ecological concern is evidenced by the economic turnover of recreational fisheries. In Germany the turnover per year is about 5,2 billion €. The economic turnover from professional fisheries in these parts is only 10 million €. More then one million Germans enjoy going angling at least once a year within the country or in other countries. 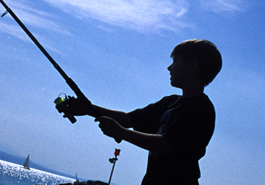 Nationwide, around 1.5 million people are officially registered as owners of fishing licences. This coupling of angling activities and aquatic ecosystem management means that the relationship of anglers, fish stocks and water bodies are closely intertwined. Scientists call this relationship a coupled social ecological system. If you want to read more (in German), please check: ARLINGHAUS, R. 2004. Angelfischerei in Deutschland: eine soziale und ökonomische Analyse. Berichte des IGB 18:1-160. Download. A very common management tool used by anglers is fish stocking. Fish stocking describes the process of introducing cultivated or wild fish into different water bodies to support the existing fish stock or to reintroduce fish species. By this means people try to compensate for a lack of natural reproduction, to maintain or improve the angling potential of the fishery or to reintroduce species. In Germany the planning and implementation of fish stocking is mostly done by angling clubs (employees as well as volunteers). These clubs are supposed to have a large interest on sustainable practices. Thanks to their remarkable involvement they have managed to save many species and to compensate for a range of harmful influences that have their origin outside of fisheries. A systematic evaluation of fish stocking as a management practice is currently lacking. More and more hints show, that fish stocking should not be taken as a panacea. There might be unforeseeable consequences for the water ecosystems and the genetics of fish populations. The lack of objective ecological and economical evaluation as well as incomplete and emotionally-fuelled perceptions about the risks of stocking can fuel conflicts between several interest groups. For example there exist well documented controversies between environmental associations and fisheries. Both have published contrary reports about the effects and benefits of fish stocking. Additionally there is a lack of cooperation between scientists and local angling clubs. Scientific knowledge and practitioner knowledge regarding water body management is not integrated. An objective evaluation of fish stocking is necessary for several reasons. First of all to minimize ecological risks, secondly to optimize the costs-benefits-relationship for angling clubs, thirdly to bring a more objective view to the controversies surrounding fish stocking, and finally to increase the acceptance of the angling clubs efforts in the society. For these reasons a cooperative research project, that combines scientific and practitioner perspectives and that integrates the specific local, ecological and economic circumstances is needed. In sum, there is an urgent need for transdisciplinary research for coupled angler-waterbody interactions. Through such a participatory process, fisheries scientists and angling clubs should together be able to develop “best practice” for sustainable stocking. Due to the obligations placed upon anglers by German law, ideal conditions exist for the development of such a co-operative framework. These co-operative partnerships will be developed and strengthened by the Besatzfisch project.